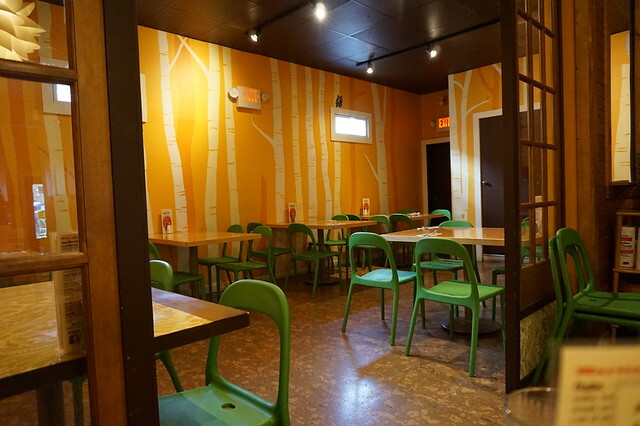 Madison, Wisconsin – The Green Owl – vegan in your city. Our last morning in Chicago was spent running around the city going to REI (a US version of Mountain Equipment Coop) to get some last minute camping equipment we noticed we needed after our time in Michigan, and then we were on the road again – next stop Madison, Wisconsin. We stuck to I-90 most of the way from Chicago, and the drive was a little under 3 hours. Driving up was lovely, and as we came into the city we could get why it was called the City of Four Lakes (though I only noticed two…), the greenspace near the lakes and the reflecting cityscape were beautiful as we travelled up John Nolen Drive. The thing I find kind of funny about Wisconsin, is that most of their license plates say “America’s Dairyland” and here we were planning a stop, and planning to find something vegan to eat besides buying a bunch of vegetables from a market. But, no, much like my beloved Prairies in Canada, Madison has a lot of awesome stuff going on, and it’s not even that hard to find. Madison is named after the USA’s fourth president, James Madison, and is the state capital. It’s also the second largest city in Wisconsin (second to Milwaukee) and home to the University of Wisconsin-Madison. If we didn’t have a schedule to keep, it would have been nice to stay in Madison a bit longer and explore the area, but we only really had time for lunch so we visited The Green Owl. We found the Green Owl on the Madison Vegan website, which has a whole bunch of vegan friendly recommendations for Madison and area, and is a resource from the Alliance for Animals and the Environment. 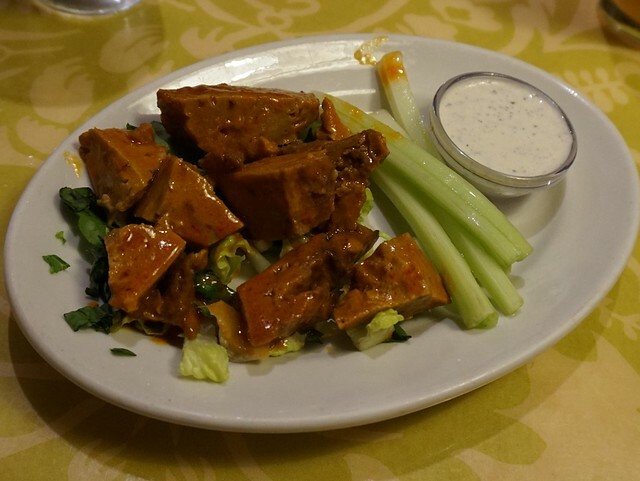 At the moment The Green Owl is the only meatless restaurant in Madison, it’s lacto-ovo-vegetarian with lots of completely vegan options and the full menu is veganizable. Check out their menu and you’ll see what I mean. There is indoor and outdoor seating, but the oppressive heat of the day encouraged us to sit inside this nicely air conditioned restaurant and relax. We were one of a few groups of people sitting inside (a more sizable amount of people were outside enjoying the heat for some reason…), and service was quick, friendly, and helpful. These wings are wheat gluten based, and had a pretty good sauce on them, the vegan ranch-y dipping sauce was nice a contrast to the spicy sauce. 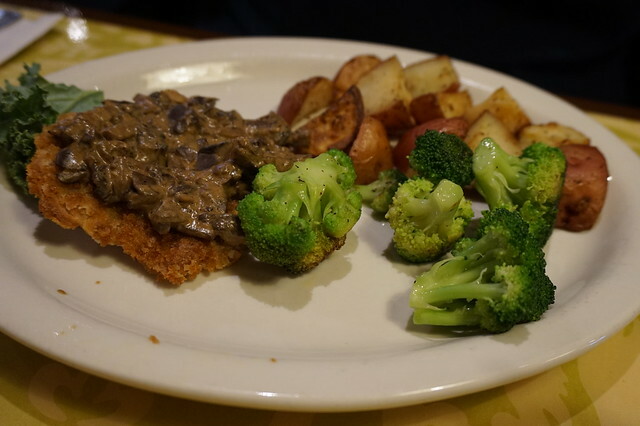 I wanted to order this when I saw it, but JC did it first and it always seems silly to both order the same thing (though it does happen) I stole a few bites of broccoli and schnitzel and it was really really good. For reasons unknown, I ordered the Campanelle pasta with Alfredo Sauce. I think our server might have recommended it, but I usually don’t go for pasta dishes when I’m out, unless that’s all they’ve got that’s vegan. But for some reason – today was pasta day. Overall, I still liked it, the sauce was a bit too sweet for me, but if I liked the sauce, I would have wanted this dish to be saucier. Why did I order this? 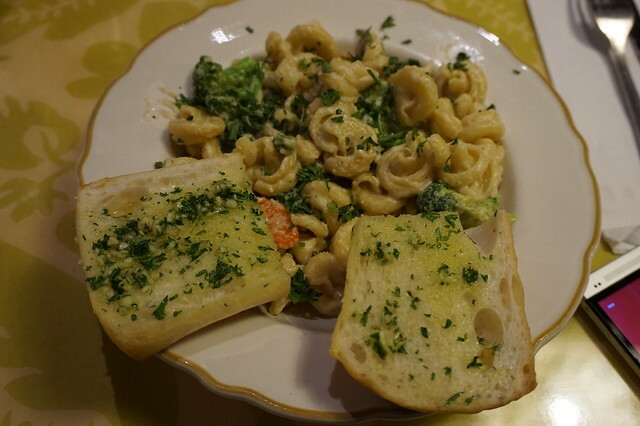 Probably the garlic bread and the broccoli, both of which were excellent. I think it’s worth blaming any of my issues with this dish on user error. If you usually like creamy pasta dishes, then this might just be your scene. If you normally never order pasta, there are all these incredible sounding dishes on the menu for you to try. And finally. The desserts, which were amazing. And I try not to just throw that word around, but maybe I do. This time I mean it. That said, while they do have a dessert menu, the desserts still vary based on availability. 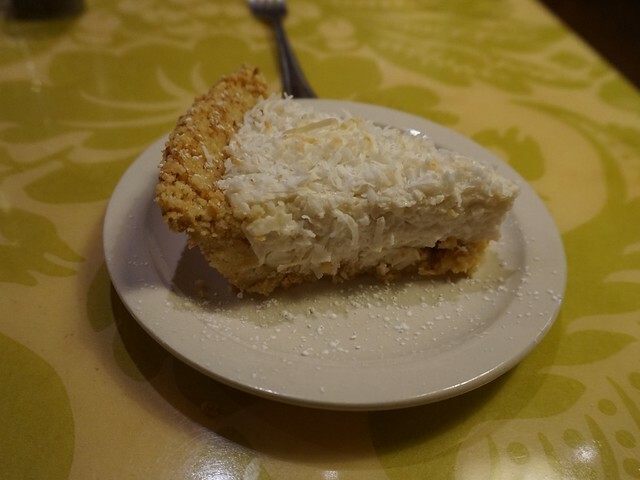 Anyway, look at this coconut cream pie. It was creamy with a strong coconut flavour (as you might expect) , and topped with a whole bunch of extra toasted coconut. And the crust had a fantastic crumbly crispness vs flakiness, which for this pie worked really well. 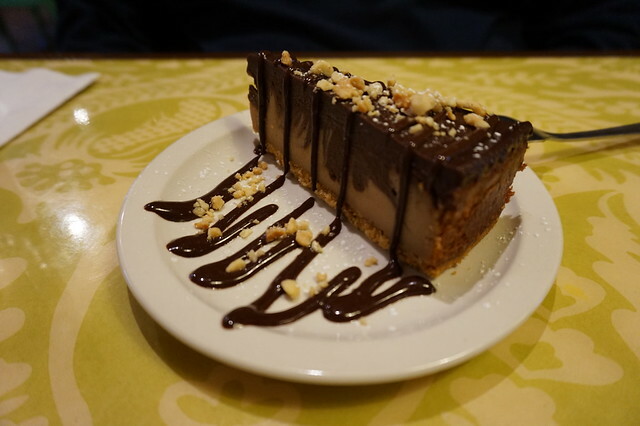 And this was the Peanut butter chocolate cheesecake which was rich and we probably could have just shared it and been done, but we took around half of this to go. My favourite part of this was hearing about their “cake lady” from our server. I feel like whenever I go to a place that isn’t quite ready to have a full time dessert/pastry chef baking up some amazing vegan cakes and treats there is always this wonderful “cake lady” (or generally, any hyper-skilled person) that makes these things possible. So to all the cake people out there, thank you. Seriously. And to all the restaurants using the service of these cake people, thank you as well. I appreciate when people play to their strengths, and I think it’s cool when places want to do something really well and they pull people from their community in to make it happen. One of the reasons I wish we could have stayed a little bit longer in Madison was because of a poster I saw up at The Green Owl for Heartland Farm Sanctuary. Heartland is very similar to Ontario’s own Wishing Well Sanctuary in that it blends working with and rehabilitating abused and neglected farm animals with working with at risk and abused and neglected youth. madison, Roadtrip2014, The Green Owl, vegan, vegan madison, wisconsin. Bookmark. Oh those mosquitos! There weren’t that many in the city while we were there, but the moment we drove out of town – BAM. So many, and it didn’t let up until… well, it just kept getting worse as we went North (to Manitoba). Eek. The thing about Madison is that we could sort of feel like there was so much more to it, just by driving in – certainly seems like a special city, for vegan folk and otherwise! I am really glad that you enjoyed being in Madison, WI. I’m from Milwaukee and have spent a TON of time in Madison (and still do yearly, though live in a different state now). Only correction is that the Green Owl is NOT the only veg restaurant in Madison. It may make Happy Cow and other veg-friendly websites, but it is not the only meatless place to dine. Ladonia and Mother Fool’s come to mind, and there are dozens of other veg-friendly places in Madison and the surrounding areas as well. Hi Crissie, thanks for your comments. I realize there are various vegan-friendly places in Madison, but the other two you suggested didn’t seem like actual restaurants when we were there, at the time they just looked like coffee shops (and we had drank plenty of coffee already!). Plus Green Owl Cafe likes to call itself the Only Veg Restaurant in town! Anyway, we’ll know for next time. Thanks. I love Madison for vegan eats! So many great choices. 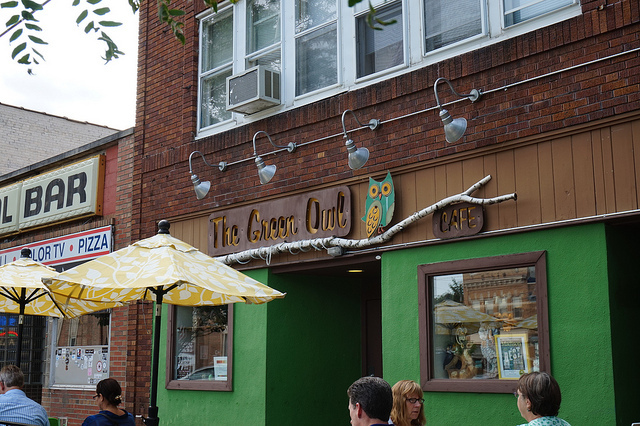 I have been to brunch at The Green Owl and it was great!